Six people have suffered burns and hundreds of passengers have been stranded by a major fire between two train stations in Mumbai, India, according to local reports. The fire broke out on Monday evening between the Chhatrapati Shivaji Terminus and Masjid railway station, according to The Hindu newspaper. Train services were suspended on the two tracks of the busy central line, leaving hundreds of passengers stranded waiting for trains. “Crowd management is turning out to be an issue and the police are helping us with it,” a fire brigade official said, as quoted by The Hindu. Twelve fire trucks and six water tankers have been dispatched to fight the blaze. The New Indian Express are reporting that six people, all of whom are minors, have been injured the fire. The fire was reported in the south Mumbai area of Dana Bandar area at around 6:15pm. The Hindu are reporting that it is a Level III fire, signifying high intensity. 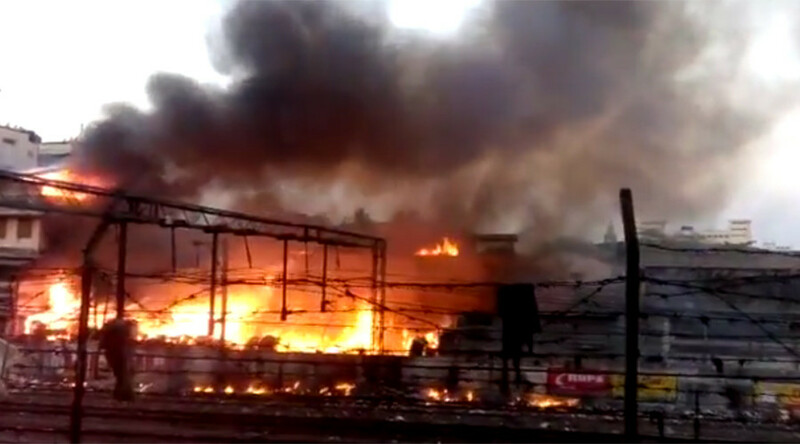 Railway officials said that services on tracks three and four were suspended as the fire lay too close to the tracks. The official Twitter account of India’s Central Railway has retweeted a message saying that the line was operating normally again.